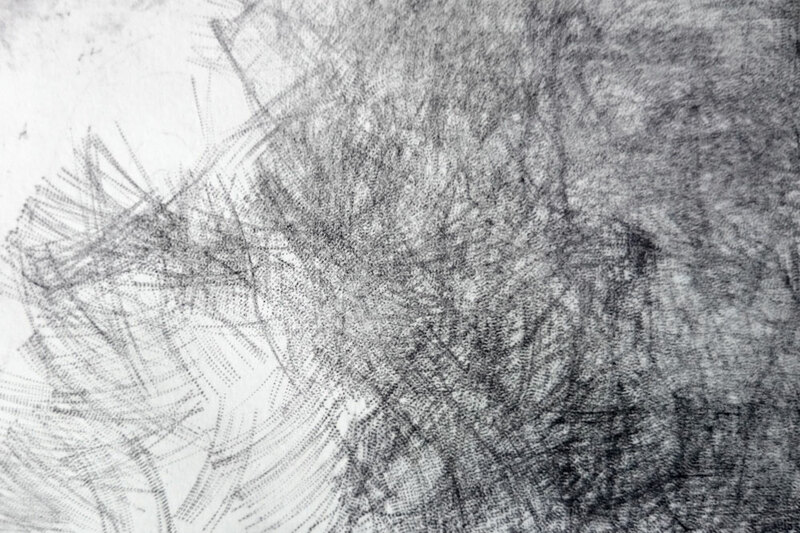 Falling to bits, well chewed, a bit rusty, almost like belly button fluff with a hook. The old flies are the best. 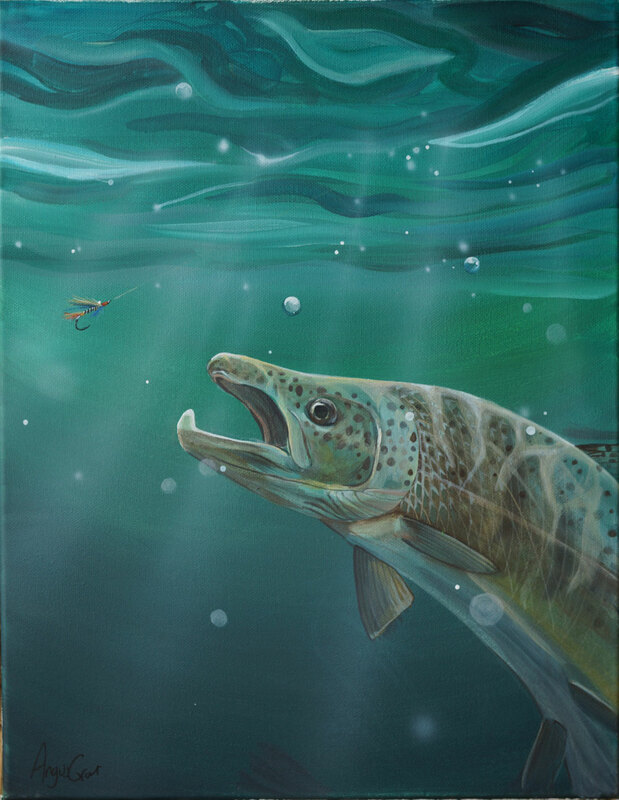 Categories: Painting | Tags: fish, fly fishing, underwater | Permalink. 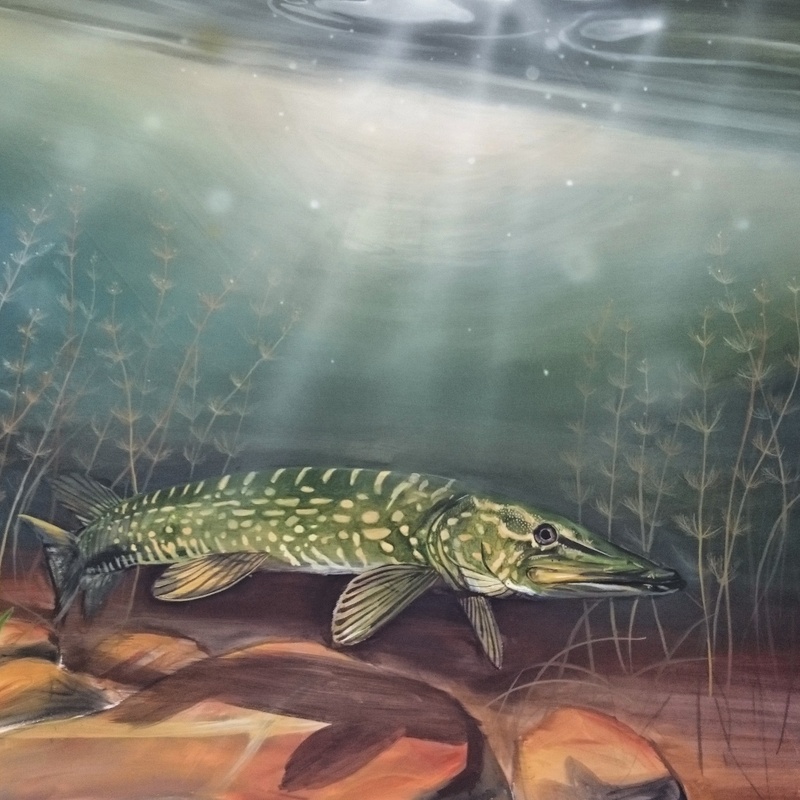 Have been busy painting some more underwater pictures for the upcoming exhibition. It’s good the sun’s been out a bit recently. 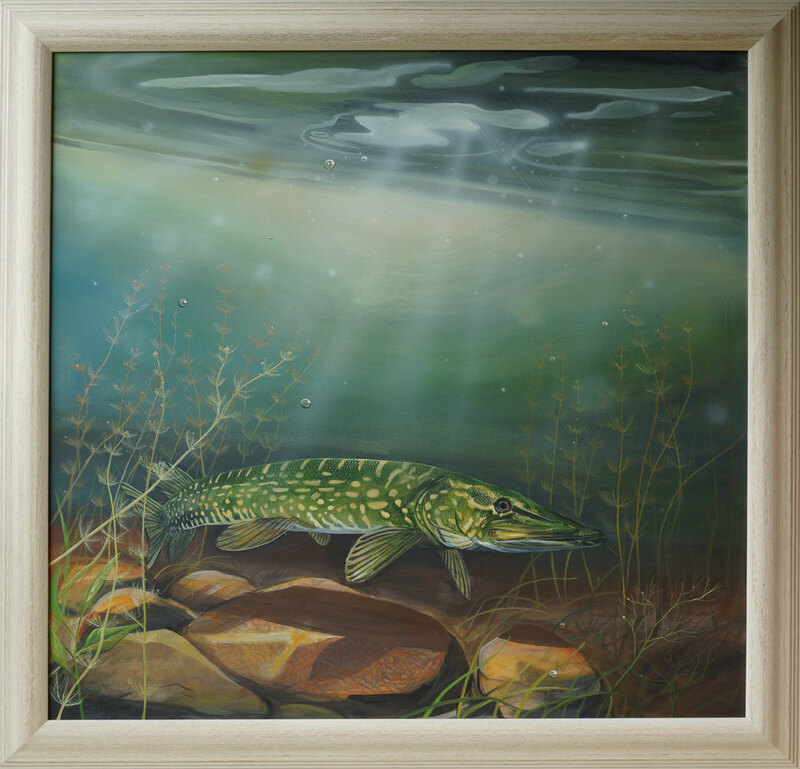 It’s helped me gather some lovely photos to inspire these optimistic fishing paintings. 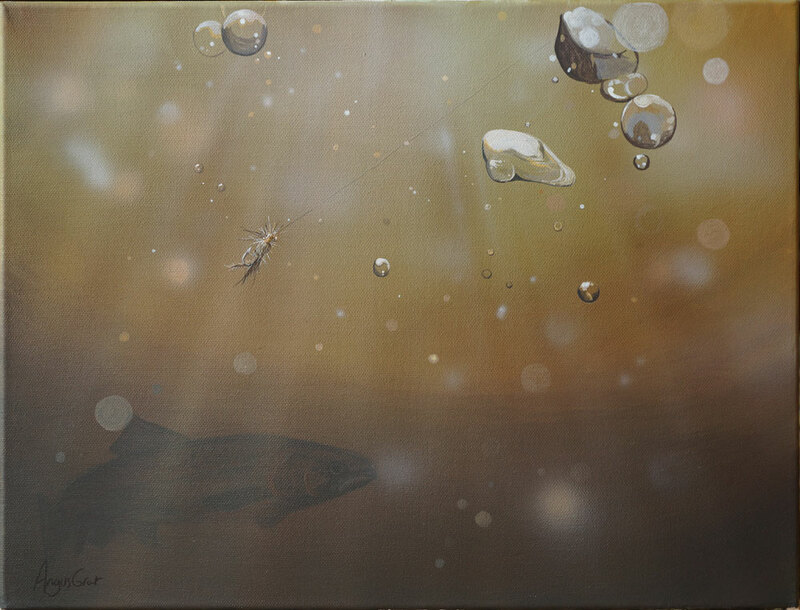 Categories: Exhibitions, Painting | Tags: Beneath the Surface, fly fishing, underwater | Permalink. 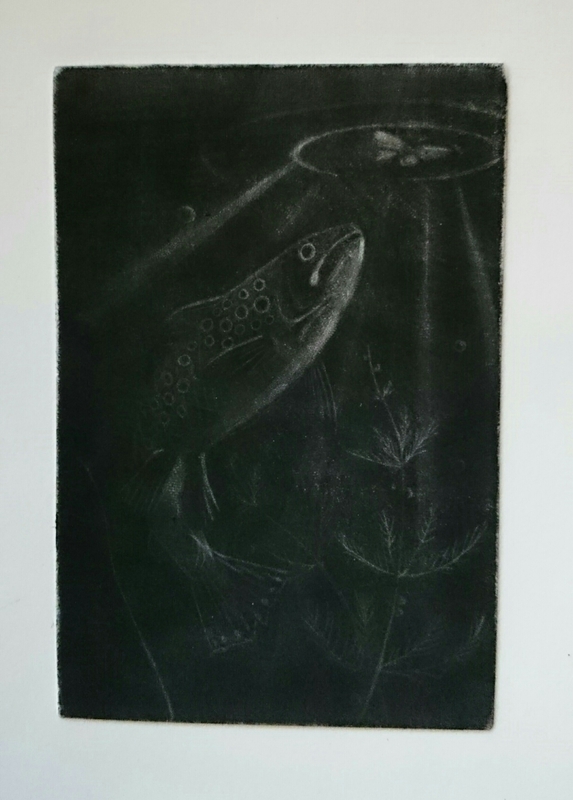 First take a nice shiny copper plate and rock the mezzotint rocker across its surface to cover it in lots of wee dots. 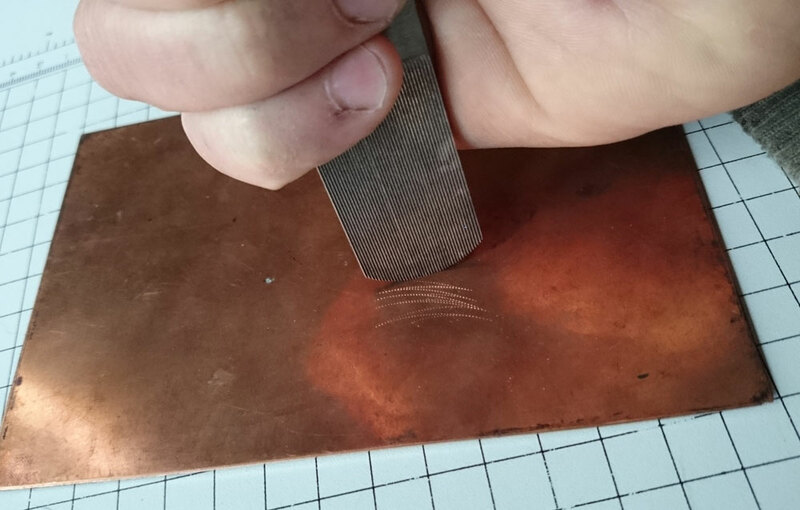 As you add work across the surface of the plate you will create more and more wee dents that will hold the ink nicely. After a while you will see that it is possible to create a nice black tone. 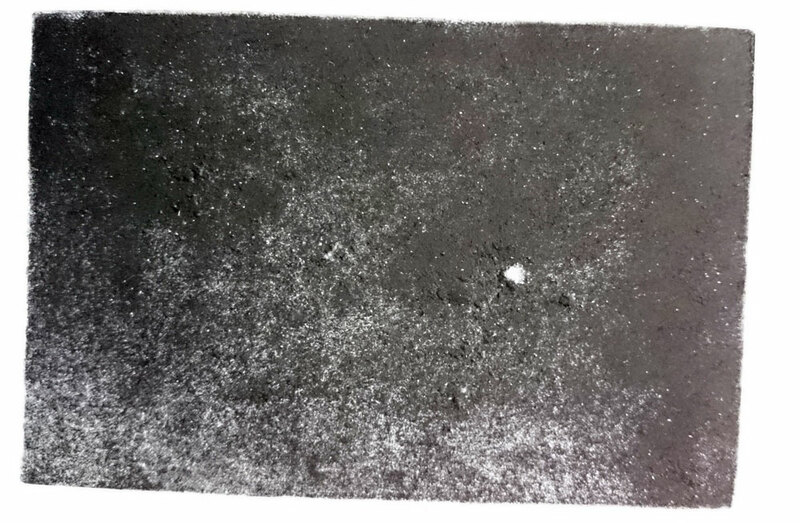 After about a day of mezzotint rocking you will be close to getting a nice even texture to your plate. You will have decided that the £35 that the art shop was charging for machine mezzotinted plates was an absolute bargain. 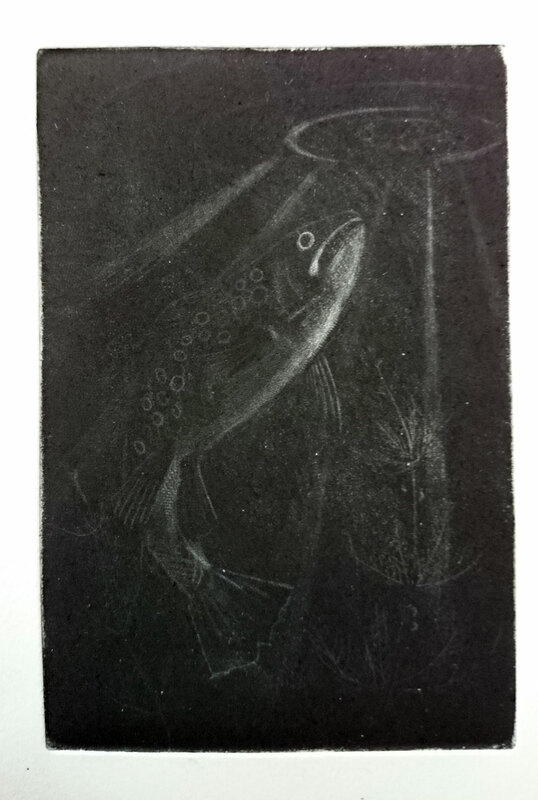 You will go to bed and dream about mezzotint rocking that night. 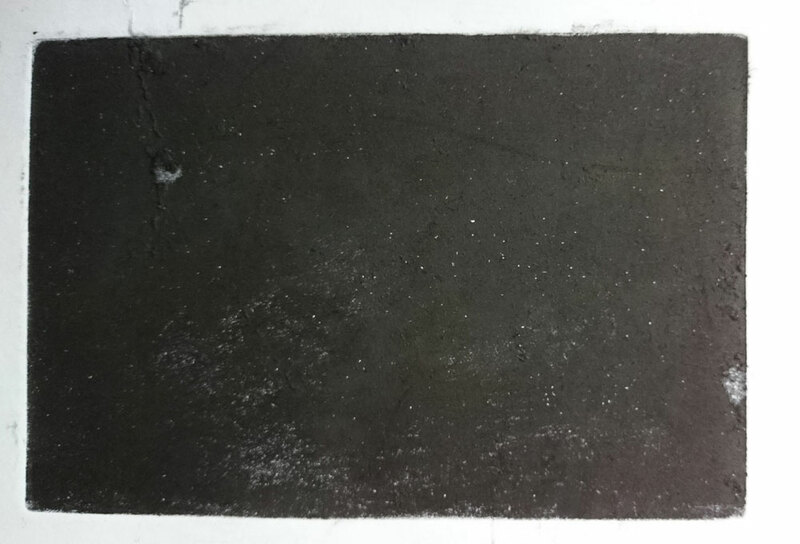 You will have vowed never to mezzotint a copper plate by hand again, but your 10x15cm plate will print a nice rich black. 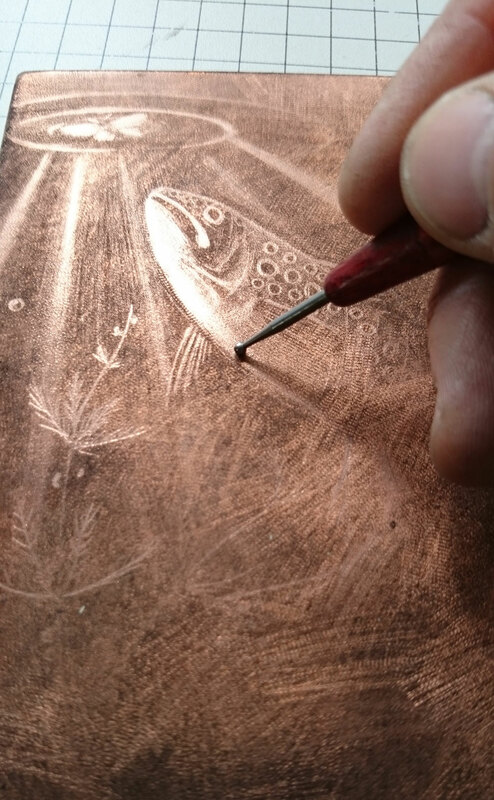 You create your image on the mezzotinted plate by selectively polishing areas of the plate so they don’t hold the ink as well. The polished bits will be a lighter tone. 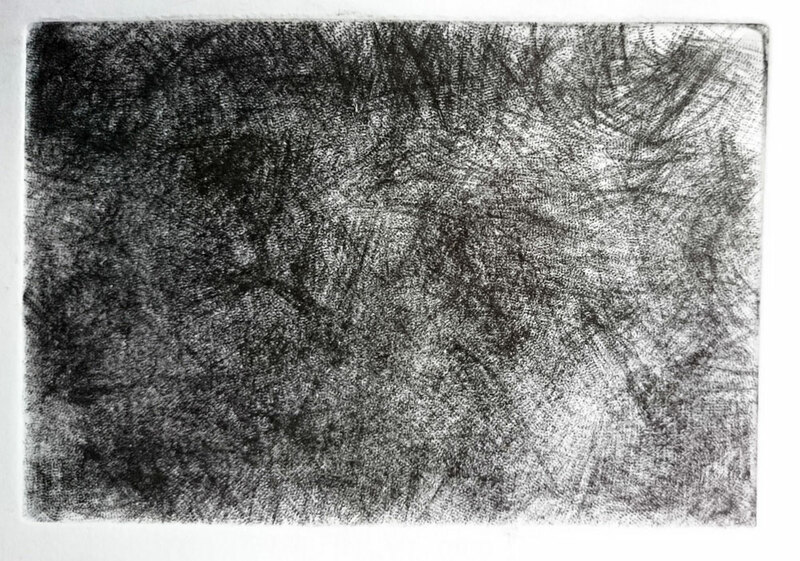 You will have to make lots of wee test prints along the way to see how you’re doing. 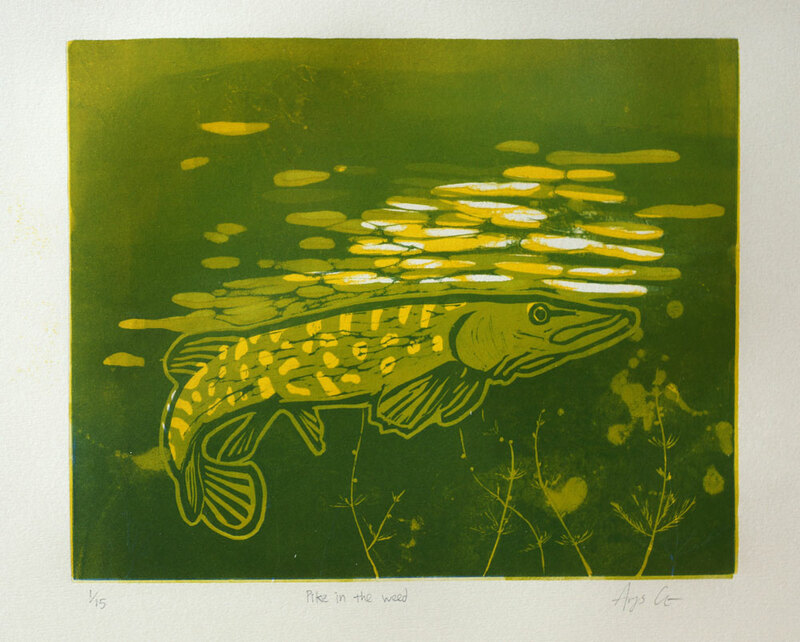 Categories: Etching, Printing | Tags: mezzotint, trout, underwater | Permalink. Getting ready for the wee exhibition based on this wonderful film. Having a great time making fishy pictures. Hopefully all complete for the 4th of February. 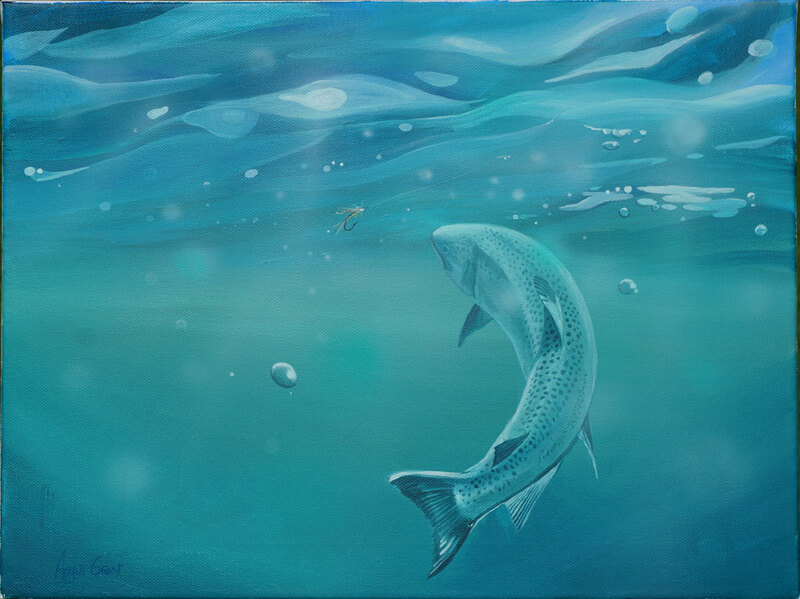 Categories: Exhibitions | Tags: fish, Food on Film Festival, underwater | Permalink.